what do the Braves do to bolster the bullpen for the second half of the season? I don't know. Not so long ago, Shae Simmons was being regarded as a real find. Nobody gets everybody out. Not even Kimbrel. Do you believe the Braves should give Shae Simmons some AAA work? I feel like he needs work on his command. Nobody asked (at least not yet), but I'd say the next nine days will mostly see the Atlanta Braves linked with relievers. There are always relievers (if not closers, which the Braves don't need) available. Even bad teams have good relievers. Yesterday my SportsCenter app alerted me that the AJC is reporting the Braves are interested in Andrew Miller. Strange, because I couldn't find anything on the AJC about it. Any rumors floating around? I believe Mr. DOB wrote about Andrew Miller a while back. The Braves would love for someone to be interested in trading for B.J. Upton. I cannot imagine what team would be. He's a bad player -- although he has been better as a leadoff hitter than I thought he would, which isn't saying a lot -- with a terrible contract. He's not going anywhere. Aside from Uggla, is there anybody else who may not be back for the start of the 2nd half? Could Avilan be dumped? He's been awful lately. ... Do you have an update on Venters? Will he be able to help at all this season? If so, when? 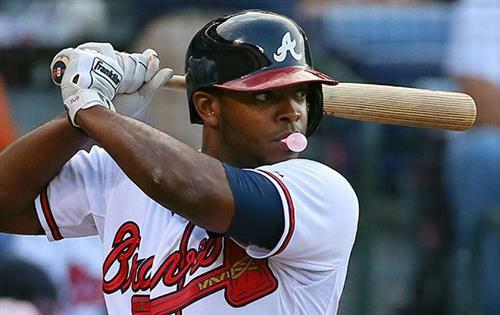 In 18 games since moving to leadoff, BJ has hit safely in all but 2 of them and has scored 13 runs. You would think fans would be happy to see this recent production (I sure am), yet you mostly hear continued complaints. Your thoughts on BJ in leadoff and his recent success? I really dislike the idea of ever going to computerized calling of balls and strikes. But every time I hear the mention of catchers and their ability to frame pitches make me think different. A pitch is a ball or strike, period. There are guidelines. If an umpire is swayed by the glove or other things, he deserves to be fired. I see him being kept around for financial reasons that the powers that be are working under. I think right now he's not taking the spot on the roster of somebody who could be helping the club. You would think there's a good chance that changes going forward when the Braves make changes in their roster to prepare for the stretch run. That's when it gets interesting. And Uggla's tardiness and his one-game suspension suggests to me that both sides are getting a little wary of the situation as it stands. Carroll, if the Braves do not find a home for Uggla by the end of July, do you think he is DFA'd the next day? In other words, do you see him being kept around purely to try to move him or for other reasons? Thanks TN Brave, I appreciate that. As for the rotation, just know that the plan is to pitch Santana on Friday against the Phillies and Teheran either Saturday or Sunday. I know they want to split up the lefties Minor and Wood, and then work Harang in there. Hi Carroll! Thanks for all the coverage. Any word on the order of the starting rotation coming out of the break? Any other tweaks? I know there is a tough stretch of games coming up a couple weeks down the road. Best wishes on your upcoming plans! Given the price in terms of return that some of the big names out there are going to draw, I think the Braves would have a hard time pulling off a trade for a top-of-the-rotation starter. And that's what you'd need to improve on what they already have going. i guess if you're looking at the stat line, that's what you see. I'm watching him throw. I'm watching him frame pitches. And how he handles himself with confidence, calling games, etc. Hey Buddy, it's a really, really beautiful park if you ask me. I was looking around last night and just love the way you look up and see layer upon layer of seats, five decks down the lines, and yet the way they're build, at a pretty steep angle, it still feels intimate. And it plays like everybody can see everything well, and just feels like a good baseball park. I know I'll never forget watching that ball jump off Stanton's bat to about six rows from the top of the third deck.....The atmosphere downtown and just walking a few blocks to the ballpark has been cool. People have been friendly and patient. Good baseball people. hey carroll! how's the atmosphere up there? how's that ballpark? i get the impression that's the braves' model for the digs. how are the sightlines? Not good. I think you'll see him back in uniform after the break. And they would swap and arm for an arm, not an arm for a position player. That's a good question and if you're the Braves a good "problem" to have. Bethancourt has shown that standout defensive ability that we've been hearing about for years during this stint with the big league club. Yet from everything Fredi has said is that Gattis is their guy behind the plate, and when he's healthy Bethancourt returns to Triple-A. But there are questions now with Gattis' back injury and they won't be answered until he shows he's ready. On down the line things could change. Maybe Gattis moves back out to left field, but at least in the short term, it's behind the plate. Is Wren pursuing any trades? DOB, any chance we go after Zobrist or Beckham? Zobrist for his versatility and would fit nicely in the 2-hole and La Stella may be better served on the bench. Or Beckham to platoon with La Stella because he crushes lefties? Bethancourt needs to play, and there won't be enough playing time for both him and Laird. Doumit is a third catcher but mainly a pinch-hitter and backup left fielder. Bethancourt is a catcher, period. Can't see him being kept on bench to play once or twice a week, and don't have room for that on 25-man roster anyway with Laird here. DOB, is the assumption that when Gattis is healthy that Bethancourt will be sent back down, or could we keep him and Laird on the bench together? Because Doumit can play other positions, I assume he is safe as well. That mainly depends on need. They called up Bethancourt because they had a need. They needed a fill-in for Gattis, and Bethancourt was ready. Next Braves prospect, aside from bullpen, to get the call up? Thanks for the questions, folks. Wrapping this up to do my video bit. We'll do it again soon, I feel sure. I BELIEVE THAT WE WILL WIN!! Thanks have a great day. GO BRAVES, GO USA!! Let's be happy he's hitting at all. How do we get BJ, hitting 1st, to be happy with walks and singles? None yet, at least none that I've heard. But there are always arms available. Even bad teams have good middle relievers. Any buzz on possible bullpen help? At all, yes. But not so enthusiastically that they consummate a trade. Do you see the Braves going after David Price at all? Can the USA win today?? I'd be surprised if this roster move involves Uggla. Beyond that, I don't know what it will be.